On his first record for Yep Roc, Body of Song, influential songwriter Bob Mould returns to the guitar sound that made Husker Du and Sugar indie household names, and influenced countless musicians. Unlike his last few solo records, which have tried to steer clear of Mould's trademark guitar-rock sound, Body of Song embraces it. And, because Mould is embracing it instead of fighting it, Body of Song sounds that much better because of it. Recasting the reasons we love Mould in the first place - smart, clever songs, loud, lots of energy, and expression that we can't seem to do ourselves but can find solace in Mould doing it for us. Body of Song is proof that Mould hasn't given up, but has realized he is once again in his prime. Whether its the dark, textural pop of "Always Tomorrow", the electronic-infused guitar rock of "I Am Vision, I Am Sound", the tender, singer-songwriter sparkling pop offering in "High Fidelity", the pop-rock of "Gauze of Friendship", or the full-on guitar-rock of "Paralyzed", Mould seems at ease once again. Though, as mentioned above, he's still experimenting with songs (including adding elements of electronica in his songs, as he's done in the past, and still delivering softer, more folk-oriented moments). He isn't relying entirely on these elements, realizing he shouldn't be afraid to stretch and expand while leaning on the past as well. 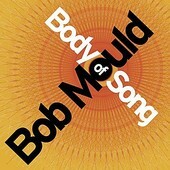 And that is why Body of Song is a refreshing offering from Mould. I'll give it a B.